We held our first Arts Festival on Sunday 21 October and the atmosphere was buzzing with children and families enjoying the artworks on display, creative arts experiences, children’s entertainment and diverse food. 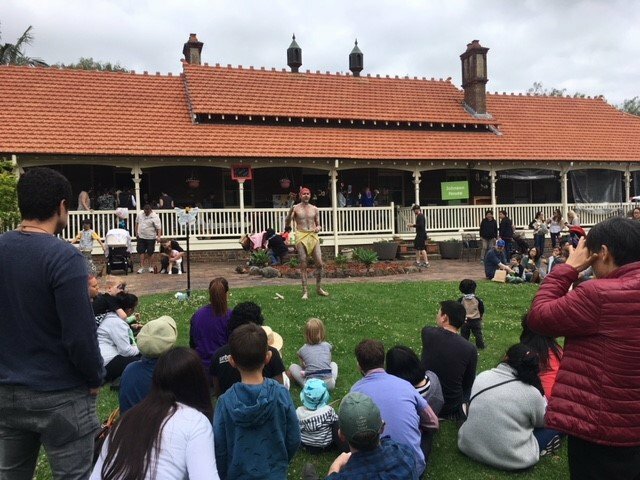 Happily the weather stayed dry and we were able to enjoy some activities in our beautiful outdoor spaces, including an Indigenous dance demonstration by our good friend Uncle Terry on the main lawn. Other highlights of the day included a mobile animal farm, face painting, a magician, an ‘arty’ cake stall and many hands-on art and craft experiences for children and their families. The Arts Festival coincided with National Children’s Week, the theme of which this year was based on the United Nations Convention on the Rights of the Child Article 12: ‘Children’s views and opinions are respected. They have the right to express those views freely in all matters affecting the child and the right to be heard.’ To connect with this, our Arts Festival theme was ‘Our World, Our Voices’. Thank you to everyone who joined us on the day to celebrate our children’s voices and to make the event a great success! The day would not have been possible without the support of our major Sponsor, St George bank, and friends of the festival: Club Ashfield, Your Doctors and Club Five Dock RSL. Here at Gorton House we have seen close friendships develop progressively this year as the children confidently participate in a variety of different experiences extending on their interests. This month in particular we have been consciously providing experiences that encourage children to work and play together they naturally develop positive social skills such as turn taking, sharing, problem solving, empathy and a sense of fair play. Building up these strong social skills will help the children to become strong and capable adults in the future. An interest in bugs of all sorts (although bees and spiders currently top the list) has been growing in Gorton Preschool this month. We have observed children making bees out of Mobilo and flying these around the garden in search of nectar, and talk of hives has even been occurring. We created a learning space where we added some posters, small plastic bugs, leaves, wood and other things from nature, hoping these will stimulate more discussion, learning and play. 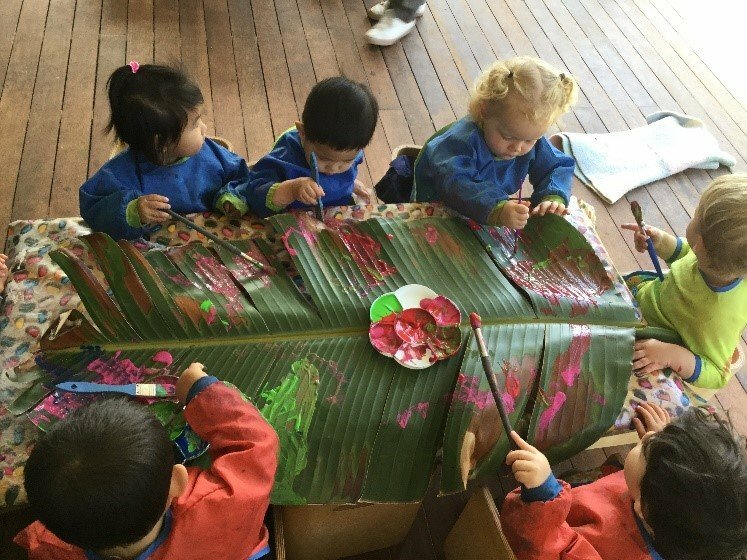 We also put some drawing materials in this area, which has helped children to reflect their learning and understanding through wonderful creations. The Educators in the Johnson House program have identified the need for the children to continually test their limits and explore the benefits of risk-taking in a safe and supportive environment. 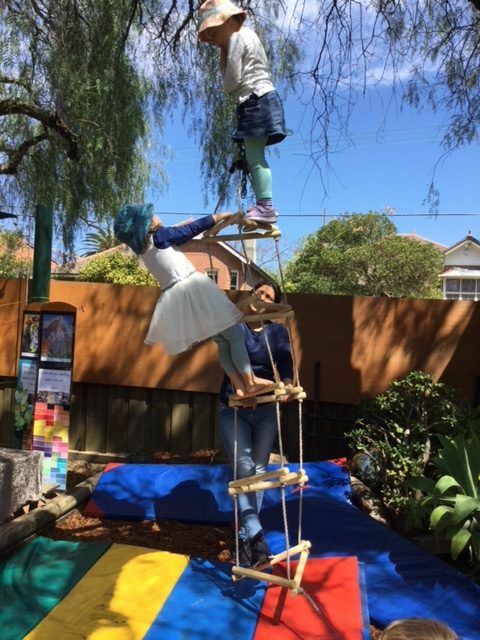 The triangular rope ladder has been a welcome addition to our outdoor environment. It proved to be very popular with lots of children wanting to test out their climbing skills. Climbing offers many benefits, including enhancing hand-eye coordination, problem-solving skills, focus and concentration, self-esteem and overcoming fears. The ladder is not fixed to the ground at the bottom which means there’s lots of balancing practice as well! The Johnson House Toddlers have been very interested in music and dancing at the moment. Some of the children were playing the tambourine and other children were dancing to the music being played by their peers. The children took turns to dance and to play the tambourine, and they really enjoyed the music and dancing! The children demonstrated confidence and were independent in choosing the activities they participated in. Uncle Terry is an Aboriginal artist who will be spending the next five months visiting Murray House once a week. The toddlers in Murray House have been building a connection and close relationship with Uncle Terry. On Thursday, we showed Uncle Terry that we have been reading the book “Kangaroo and the Porpoise” by Agnes Lippo. Uncle Terry then taught us the ‘Kangaroo Dance’, where we jumped on our legs and moved around just like a kangaroo! Murray House has been working hard on our garden this month, after pruning our basil, we raised our garden bed by adding chicken wire around the existing garden. “We need to put this here so that people don’t pick our tomatoes” said one child, as many of the little green tomatoes had been picked by curious little hands, before they had the chance to ripen. 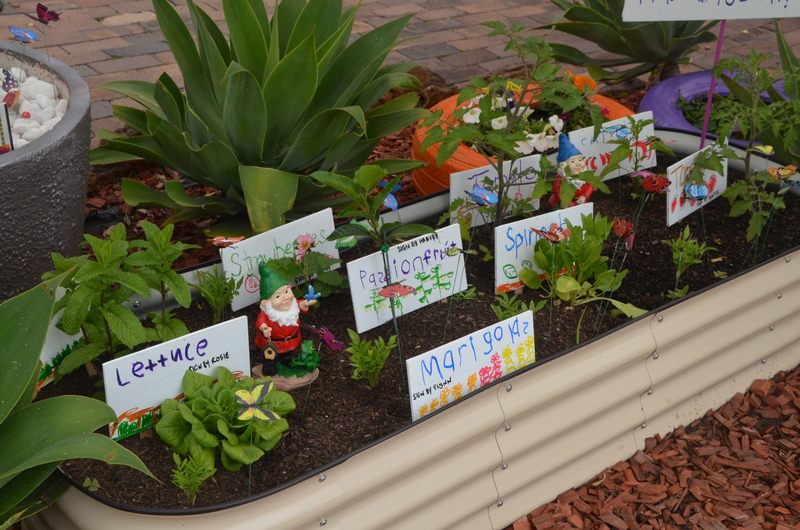 Another child added, “Yes, we have a fence around our garden so that no one can pick our veggies”. As we tied the wire to the stakes, Educator Karen gave cable ties to the children, and guided them with making a loop with the tie around the wire and the stake, then threading it through the hole before pulling tight. Although this was a very delicate and challenging process for many, the children celebrated their eventual success with a smile! Rigby Children are interested in the birds in our environment, so the educators have been reading the lovely Dreamtime story, ‘How the Birds got their Colours’. Inspired by this story, the educators have continued to further the children’s interest and knowledge of birds through a group art work. The children painted a canvas blue because, as they explained, birds fly in the sky and the sky is blue! Then the children drew their ideas of birds on the canvas. 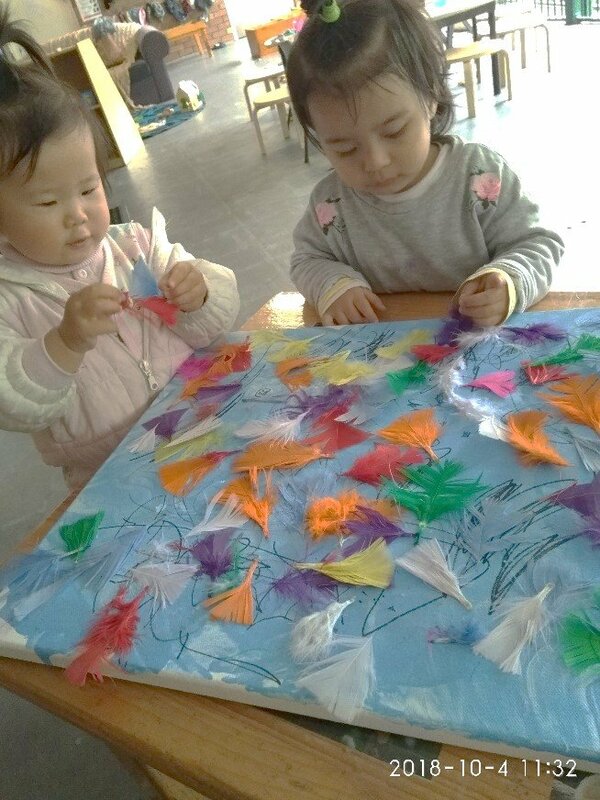 The children are aware that birds have wings and feathers, so they covered their bird drawings in colourful feathers, just like in the Dreamtime story. The children’s developing language skills were evident as they named many of the colours they were using. 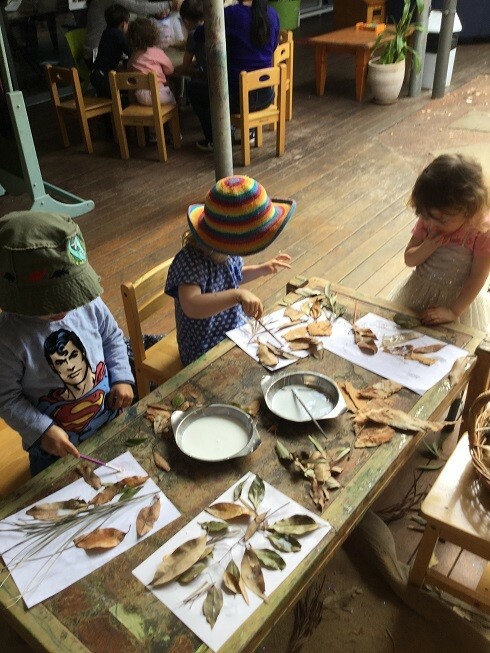 This month a small group of children at Robinson House preschool have recently been going on walks and collecting different natural materials to make a birds nest. The group of children and educators started making a big nest using some of these materials. 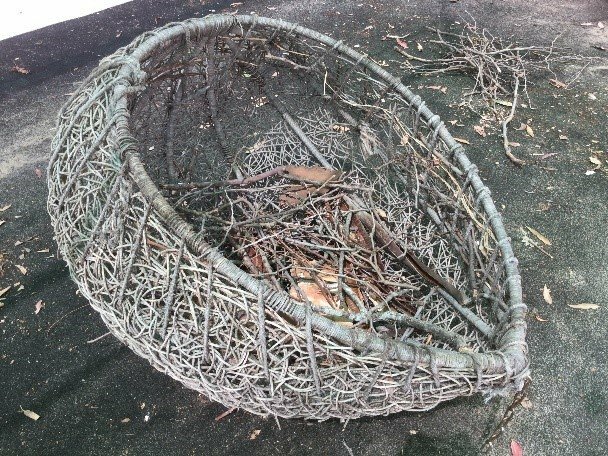 As the base of the nest we are using an old cane chair which we found on our walk. We placed big sticks, bark and leaves inside the base of the nest. Over the last few months the children and educators in Robinson House have worked together to create a dinosaur land within our outdoor learning environment. This process has involved sharing ideas and brainstorming together on how to plan a play space where we all could use our imagination and express our interest in dinosaurs. This planning involved a lot of discussions about where dinosaurs live, what they eat, the different species of dinosaurs, as well as the natural surroundings within the habitats dinosaurs lived in. 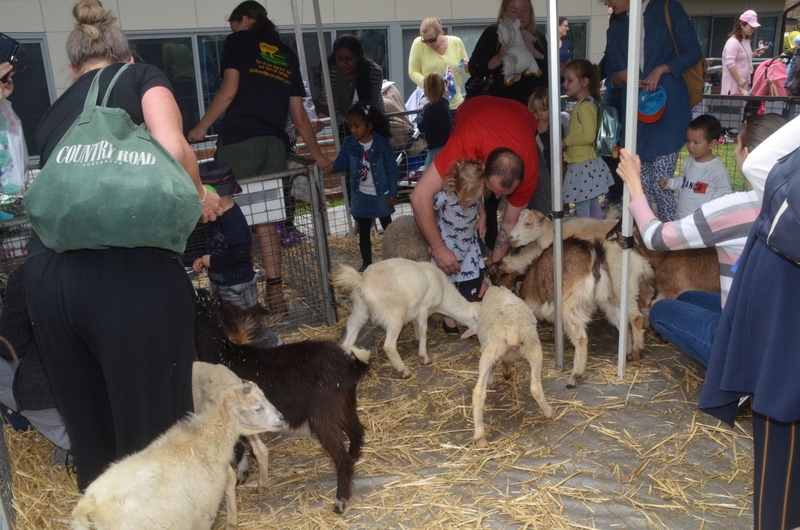 This month the children at Greenway Family Day Care have been exploring farm animals. 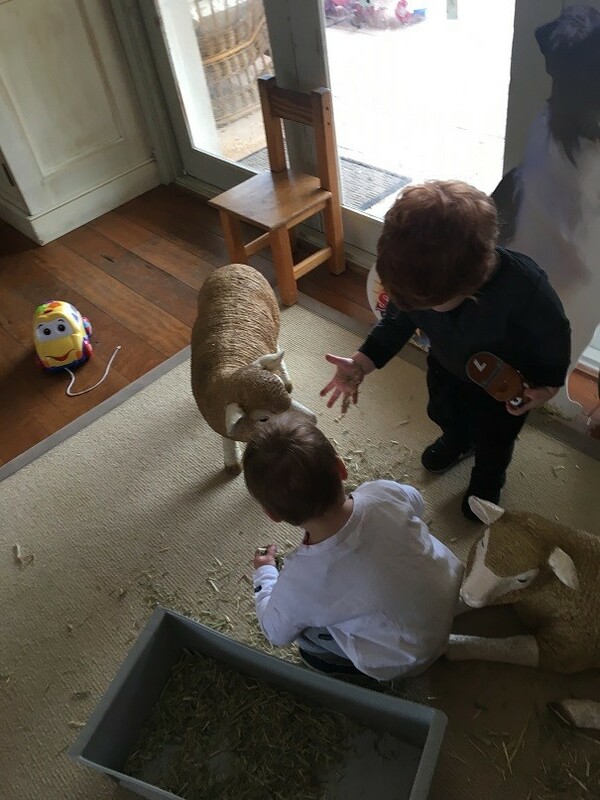 Educator Suzanne added some fabulous farm animal props and some hay to the space, which enabled the children to explore animals and what they eat. This learning experience led Suzanne to become involved in supporting the farmers’ drought relief. Suzanne and the children baked cakes and the parents could buy these when they came to collect. 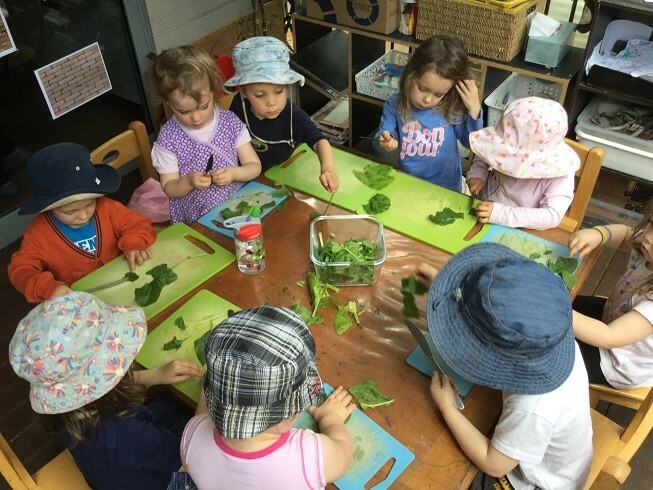 Greenway Family Day Care raised $152 for the farmers–well done! This month a teddy’s bears picnic happened at The Secret Garden in Avalon! 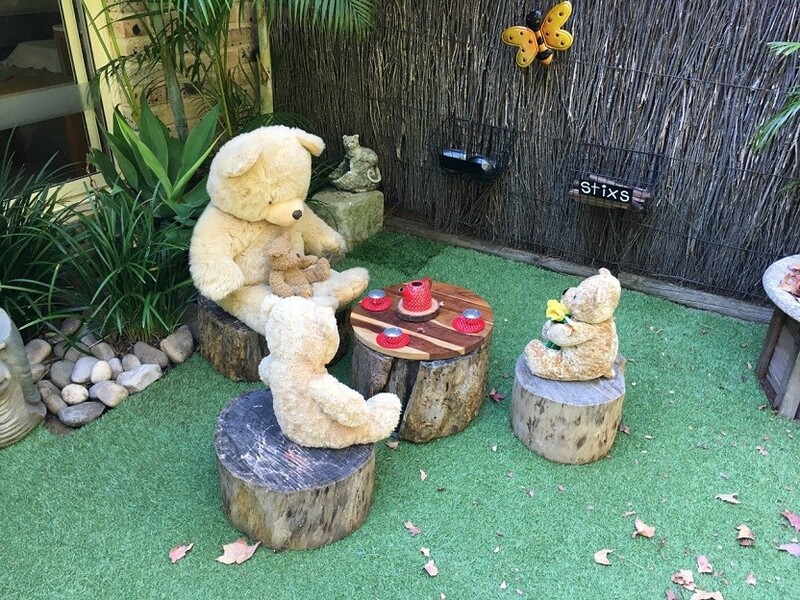 The children have been interested in teddy bears and home corner, so Educator Leanne set up a picnic for the teddy bears in the garden. 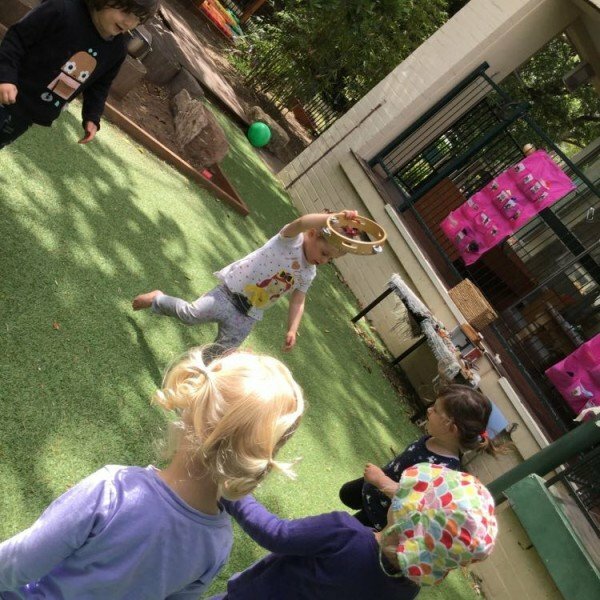 This was a wonderful opportunity for the children to extend their interest in dramatic play as well as well as to engage in play and social experiences with others. 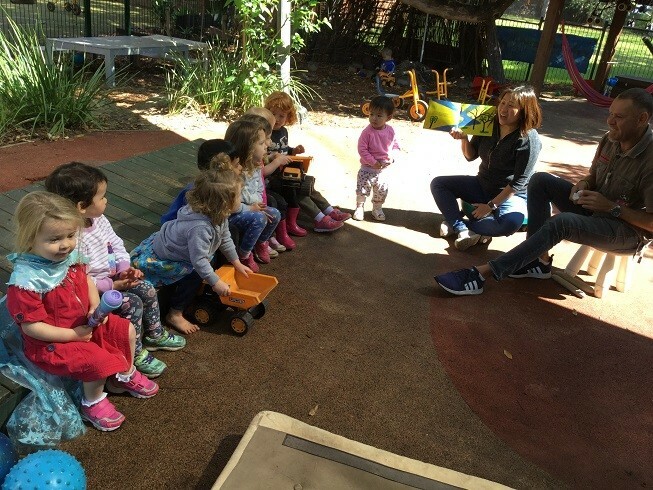 This month the Red Bug playgroup at Ashfield had an exciting day celebrating Children’s Week with a petting zoo, face painting, and craft, sand and water play. 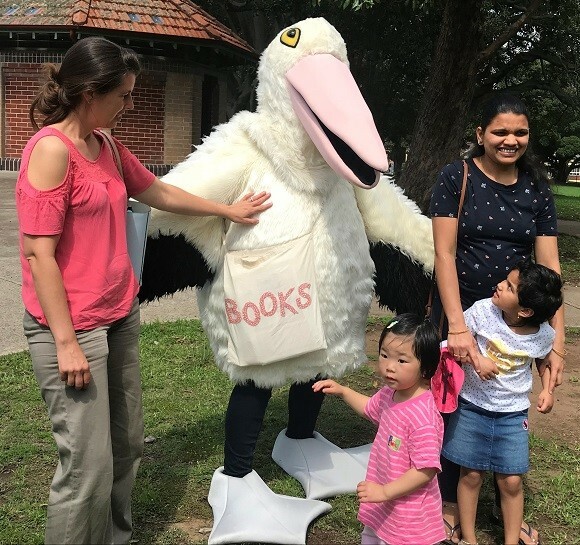 We also had a special visit from Garranga Bumarri the Pelican and Lindy, from Paint Marrickville REaD, who read stories to the children.